Our holiday is over. We returned home yesterday, and today I happily reacquainted myself with my kitchen, turning out a huge pot of soup and a batch of cupcakes in a tantalizing new flavour … but more about that another time. For now, another glimpse of life at the lake. Last week, I found a basket of second-grade tomatoes at the Juicy-Fruit Market near the cottage. For only $2.50 I got 12 luscious tomatoes. Sure, they had some markings on the skin that needed to be removed, but the quality was otherwise fine. As soon as I saw them, I knew I was going to make soup. I picked up some red peppers as well, and back to our home away from home I went to make roasted red pepper and tomato soup. I’ve made this recipe once before and blogged about it already, here. I’m reproducing the recipe below, with the modifications I made for this batch. Although I was working from memory this time, reviewing the recipe I see that I remade it quite accurately. In this version, the only herb I used was fresh basil (also from the market) since I didn’t have any thyme, dried or fresh. I added the first handful of roughly torn basil to the tomato/red pepper base while it was cooking and before I pureed it in the blender. (Next year I’m definitely bringing my immersion blender to the cottage; it’s so much easier than using a blender, and with far less clean-up.) After that, I added more chopped basil for the rest of the cooking process. 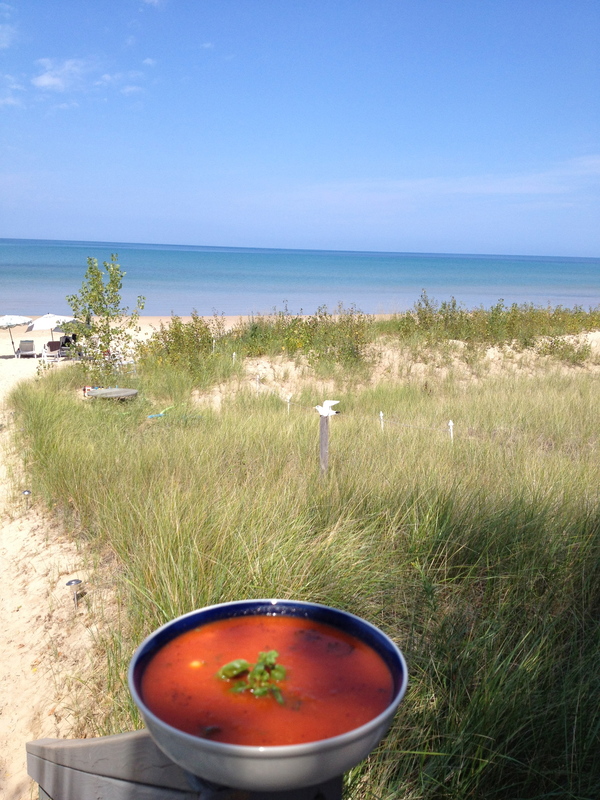 Finally, before serving I chiffonaded some more basil as a garnish. After all, basil and tomatoes are a match made in heaven! The second change that I made to the recipe was to add two cups of cooked chickpeas, for protein and texture. I could easily have added three or four cups, but I didn’t have that much on hand. I also got to try my hand at roasting peppers on the barbecue, and it worked very well. In fact, I prefer this method to using the gas stove, as I could do quite a few at a time on the grill and there’s no smoke in the house. You’ll see that even though the recipe calls for three peppers, there’s only two on the grill. That’s because one of them was HUGE. Certainly more efficient that way, as that meant one less pepper to skin and core. This soup is as flavourful as it is colourful. Even with the smoky undertone of the roasted peppers, the flavour is so bright from the tomatoes that it manages to be refreshing even served hot. The chickpeas were a great addition, making it more of a complete meal. There was enough soup for a few meals, and we had the last of it on the final night of our vacation. It was a great way to toast a wonderful holiday. 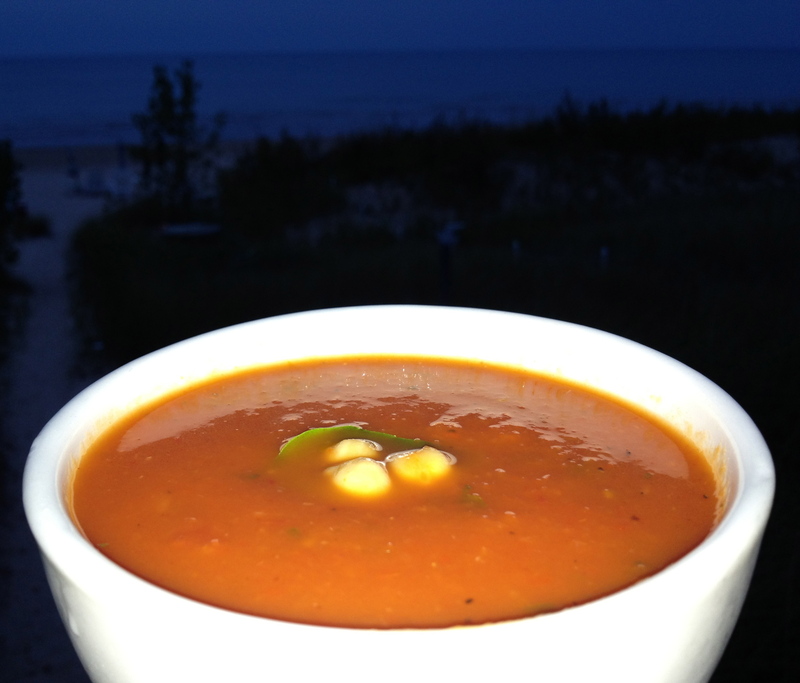 As for the photos, you can see this soup by day for lunch and by night for dinner. I wasn’t having much luck with the lighting either time I photographed it, but that’s how it goes! This recipe makes about 8 good-sized servings. 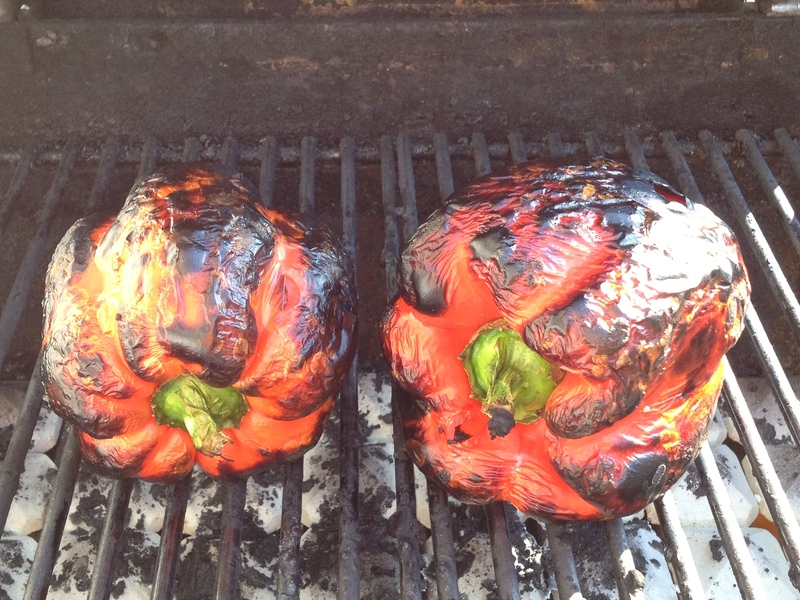 * Roast the peppers over high heat on the barbeque with the lid down, turning as the skin chars. Once charred all over, place in a bowl and cover with plastic wrap (this is like a steamy little spa for peppers). Let sit for about 15 minutes, then scrape off the skin and as much of the char as you can, remove the cores, de-seed and chop the peppers. Heat the olive oil over low heat in a large pot and add the onions and garlic. Stir occasionally, letting them get translucent but not browned. Turn the heat up to about medium, and add the tomatoes, red pepper, basil, freshly ground pepper and 1 tsp salt. Once the juice has rendered from the tomatoes, bring to a boil, then turn down and simmer for 20 minutes or so. Puree the base in a blender or with an immersion blender and return to the pot. Add the vegetable broth, the rest of the chopped basil and the chickpeas. Taste, and add more salt and pepper if you think it needs it. Bring to a boil, then simmer for another 30 minutes or so, making sure the chickpeas are nice and tender. To serve, garnish with more basil, and perhaps a few chickpeas perched atop this herby green bed. And now, to end this post a little differently than usual, here are two glimpses of the lake, both taken the morning we left the cottage. They certainly illustrate how quickly conditions can change, and how beautiful the lake is no matter the weather. We woke up early Saturday morning to a gale buffeting the cottage and the waves roaring. The wind was so strong I was concerned our raft might break free from its tether to the picnic table, but fortunately, it held. The first photo was taken around 9:00. The second photo was my farewell glimpse of the beach, around 11:30. What a glorious difference a few hours can make at the lake! 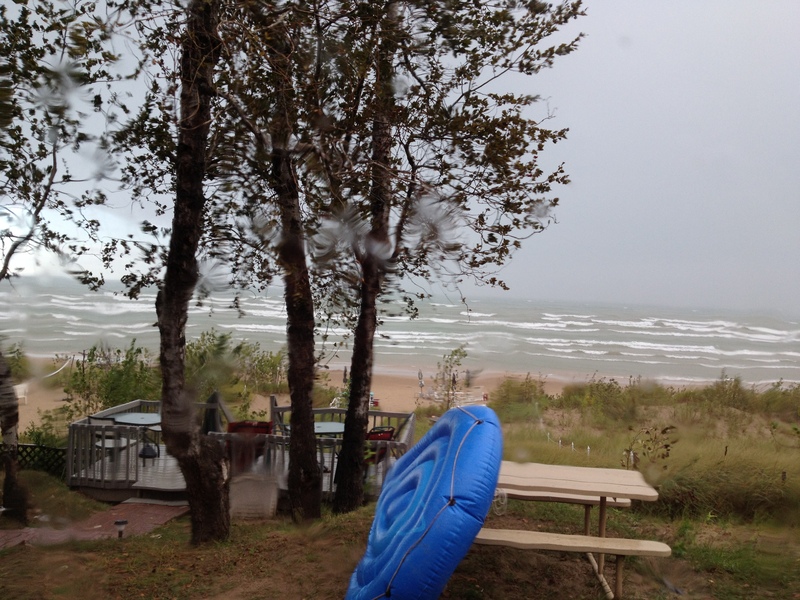 Storms on Lake Huron can turn that placid lake into an ugly beast in no time, complete with waves roaring loudly. It’s something to see, isn’t it? Your tomato soup sounds delicious, Mar. 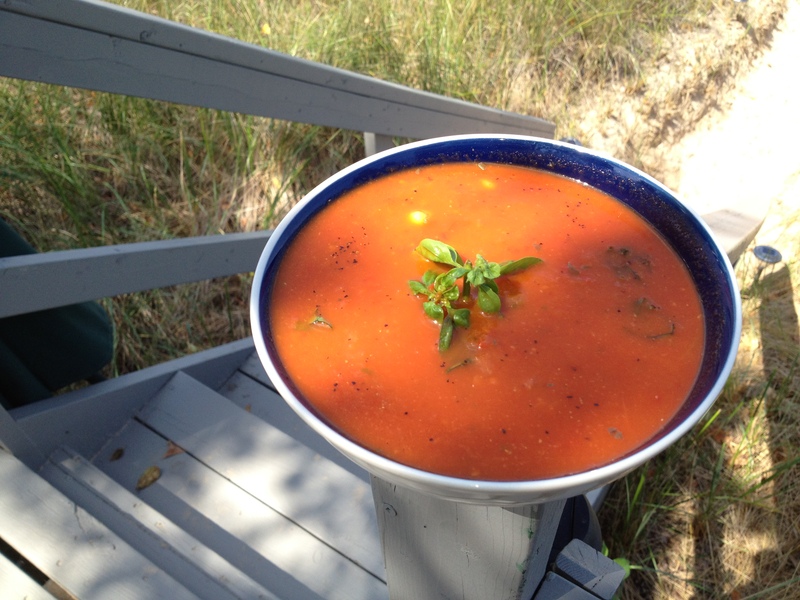 Using red peppers added both sweetness and grill flavors to the soup and, really, I don’t think you needed any other herbs besides the basil. This is just about perfect for my tastes. Delicious and great pictures of the peppers too. Thanks, Mad Dog! What with the blazing barbecue and the sun, that was one hot photo shoot! Thank you! They really helped turn the soup into a meal. Our soups certainly do look alike, although the ingredients are quite different! Thank you for visiting and your lovely comments. Happy I could introduce you to some of my favourites!